If you own an older property built before the 1970s, it is highly likely the original plans called for asbestos. This material used to be very popular due to its ability to insulate without creating a fire hazard, but today we know it is dangerous. Asbestos-containing materials can break down, releasing fibers that can contaminate your indoor air with cancer-causing dust. 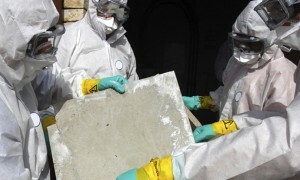 The best way to address this hazard is with professional asbestos abatement in Ontario CA. How Do I Know If Need Asbestos Abatement in Ontario CA? If inspection reveals the presence of asbestos, you will need to consider the condition of the material. In general, asbestos-containing materials are not dangerous if they are intact and in good condition. But if they are damaged, they are releasing hazardous fibers and dust. This health hazard must be addressed with asbestos abatement in Ontario CA. When you want asbestos gone, you need to call the pros at AQHI Inc.
We are serious about safety, and we provide our employees with rigorous training on how to keep themselves and your property free from asbestos contamination during work. For example, our crews know how to bag asbestos waste securely for disposal and decontaminate the bags and themselves before leaving the work area. They also know how to use wet and dry cleanup methods to capture all asbestos dust after work. If you need to get asbestos testing after the abatement project is complete, don’t worry–we won’t leave any contamination behind that could interfere with you receiving your reoccupancy permit. We have served many commercial clients without issue. Our asbestos removal office for Asbestos Abatement in Ontario CA is open Monday through Friday between 8:00 AM and 5:00 PM and closed for lunch from noon to 1:00 PM. With advance notice, projects can be scheduled for weekends, early mornings and evenings.